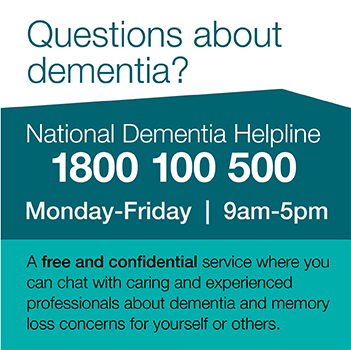 Dementia Australia has partnered with government and professional organisations to develop several guidelines and recommendations (focusing on the prevention/risk reduction, diagnosis, disclosure of the diagnosis, and ongoing management of dementia) and they have been developed specifically for health professionals. Clinical practice guidelines and principles of care for people with dementia: Recommendations. Consensus Guidelines on Dementia in Primary Care - Due for public release in June 2016 (an update of the 2003 guidelines). The Delirium Clinical Care Standard and accompanying resources provide guidance to consumers, clinicians and health services on delivering appropriate care to people at risk of, or with, delirium. Published by the Australian Commission on Safety and Quality in Health Care. Endorsed by Dementia Australia. The 'Building Dementia Practice in Primary Care' Practice Guide has been developed as part of a national project to promote the timely diagnosis of dementia in general practice. The guidelines support an evidence-based practice improvement approach to supporting people living with dementia, as well as their family and carers. Dementia Collaborative Research Centre (DCRC) - The DCRCs are a dementia research network across three centres in Australia. HealthPathways - The HealthPathways Community is a collaborative of all organisations implementing HealthPathways with links to specific Australian HealthPathways websites. Half of Australian adults remain unaware of the potential for dementia risk reduction. Many patients may feel that memory loss and dementia are inevitable parts of ageing. This is not the case. While there is no cure for dementia, an important strategy for reducing the risk of dementia is to work with patients to address modifiable risk factors. General practitioners, general practice nurses and other primary care professionals can help their patients (with or without a family history of dementia) take proactive steps to protect their brain health and reduce their risk of developing dementia. Also available for your patients, BrainyApp - an app to help patients live a brain healthy life. Researchers at the College of Medicine, Biology and Environment at the Australian National University have developed ANU-ADRI - an evidence-based, validated tool aimed at assessing individual exposure to risk factors known to be associated with an increased risk of developing Alzheimer's disease in late-life, that is, over the age of 60 years. The ANU-ADRI is intended to provide a systematic individualised assessment and report on Alzheimer's disease risk factor exposure. It may be useful for individuals who wish to know their risk profile and areas where they can reduce their risk, as well as be useful tool for clinicians who would like their patients to record their current risk profile for discussion at their next medical appointment. The ANU-ADRI is also used in research projects that aim to evaluate methods of reducing risk of Alzheimer's disease. For more information. Health professionals have a number of important roles to play in supporting drivers with dementia and their families and carers. providing advice and support to drivers with the transition to stopping driving and finding ways to stay active, mobile and connected. The Online Video Seminar Series for General Practice is an online educational video series for those working in general practice. The videos each deliver high quality, independent, evidence-based, industry expertise and information about dementia in a dynamic, engaging and enjoyable way; all while adding significant benefit to day-to-day clinical practice. Dementia care in hospitals needs to be improved to ensure that people living with dementia, their carers and families can expect to receive care of the highest quality. Any person going into hospital can find the experience stressful. For a person with a cognitive impairment - who may be having difficulty with their memory, thinking or communication - the experience can be overwhelming. The Australian Commission on Safety and Quality in Health Care acknowledges that patients with cognitive impairment need extra care and supervision to stay safe during their hospital admission. People with dementia are more likely to experience falls, sepsis, pressure ulcers, fractures and delirium while in hospital (resulting in a five-fold increase in mortality rates). This was developed in 2004 by Ballarat Health Services, as an 'all of hospital' education program to improve communication with and awareness of patients with cognitive impairment linked to a bedside alert (called the 'Cognitive Impairment Identifier ' or 'CII'). In 2014, the Commonwealth Department of Social Services (DSS) supported a grants application for the DCHP to be further rolled out at a national level. Canberra Hospital is one of four hospitals along with hospitals in South Australia, Western Australia and Tasmania to be selected as national partners with Ballarat Health Services to implement and evaluate the DCHP. For more information and updates about the Dementia Care in Hospitals Program, please visit BHS. The TOP5 Program is an innovative program, developed by Central Coast Local Health District in NSW that helps personalise hospital care for patients with memory and thinking problems. Top5 is an opportunity for hospital staff to discuss and acknowledge a carer's unique expertise and knowledge of the patient/client in terms of communication and behaviour, and incorporate their experience into the care being provided. From the discussion, five strategies are identified and written onto the TOP5 form and used to address the care needs of the patient/client during their hospital admission/stay (i.e. to settle, stay calm and receive the best care possible). For more information got to the Health NSW website or the Medicare Media Releases website. The emergency department based Aged Care Services in Emergency Team (ASET) in NSW offers help with screening and assessing cognitive impairment, determining care needs and planning and ensuring the person has a seamless transition between health/care facilities. Cognitive impairment including delirium or dementia are common among older people admitted to hospital but are frequently missed or misdiagnosed increasing their risk of harm. The Caring for Cognitive Impairment campaign is about improving our knowledge and care practices, providing better outcomes for patients, hospitals, staff and loved ones, and reducing the risk of harm in hospitals.